Medallion pattern flags of the American Centennial period represent the pinnacle of fancy design for American flags. The Centennial celebration of 1876 represented a patriotic fervor and new national pride that followed the pain and reconciliation of the Civil War and Reconstruction Era. This wonderful homemade flag was made in Fairfield County, Ohio. The flag's 38 stars explode like a firework on the canton. There are many rare characteristics for this particular flag, such as the flag's large center star, the presence of three sizes of stars in a medallion, the presence of four corner stars, and the attractive outer ring of large stars nestled together, surrounding five small inner stars, one at each of thethe tips of the large center star. One can only imagine women and their families gathering at the county fair or at local the town 4th of July celebration, each bringing their own homemade flags, one more spectacular than the other, each trying to outdo each other in the extravagance and uniqueness of their family flag's design. Such were the circumstances that led Americans to produce flags like this beautiful example, with its fanciful and wonderfully radiant medallion pattern. The family history of this flag is that it descended in the family of Willoughby Boyer, who settled in Ohio in the mid-1850s. The Boyer farm passed from Willabe Boyer to Charles & Millie Boyer, then to May E. Boyer Fisher, and finally to Lois Ann Boyer Kull. 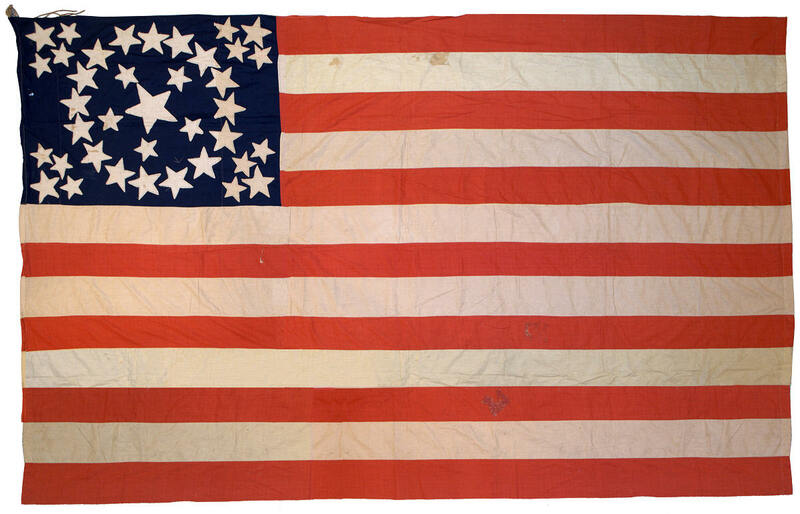 The estate of Lois Kull, which included this flag and other property from the old Boyer farm house in Fairfield County, Canal Winchester, Ohio, was sold by her son Robert Kull. Whether the flag was made in Willoughby's generation or in the generation of Charles and Millie Boyer requires more research, but it's possible the flag was sewn by Millie. 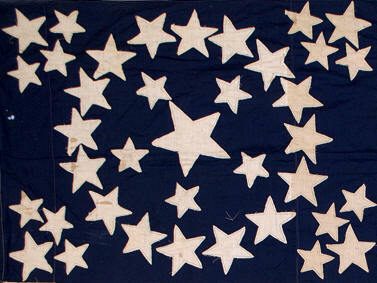 Learn more about Center Stars on American flags.